Life-sized Carving of Ivory-billed Woodpecker! 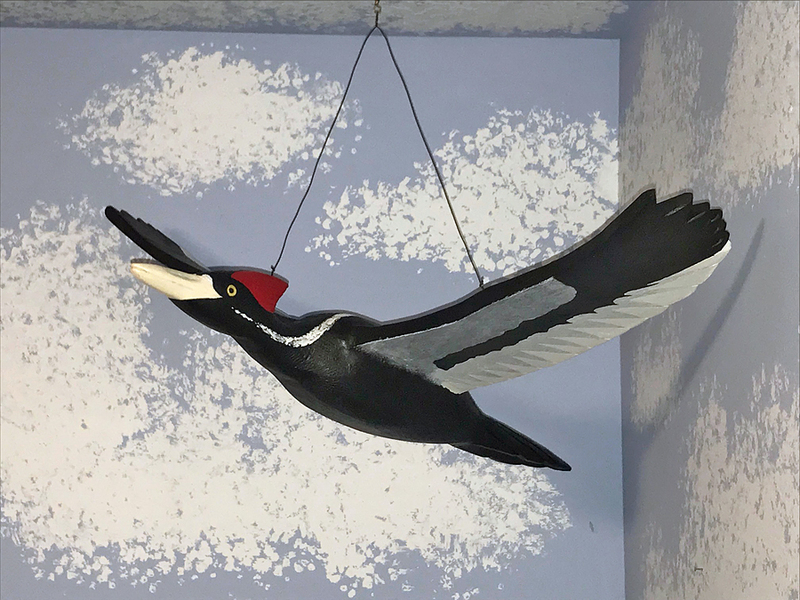 A life-sized carving of an Ivory-billed Woodpecker in flight! A wonderful piece that my son is absolutely thrilled to now have hanging in his room. My (rather shy) son is holding the piece here. February 11th, 2004…Gene Sparling was canoeing through the Cache River National Wildlife Refuge in Alabama. A very large, very unusual woodpecker flew towards him and landed in a tree about 60 feet away. Knowing it was an unusual bird, he posted a possible Ivory-billed Woodpecker sighting on a website. Sixteen days later, two curious ornithologists from Cornell visited the location, and were rewarded with a definitive sighting of the bird! A bird thought to be extinct…yet here was a confirmed sighting by respected and experienced ornithologists. In the next year and a half, Cornell researchers had 5 more sightings of the bird in the same general area. Nothing. Nothing, as in no clear, definitive photos of the species. With a handful of sightings, that’s hardly a surprise to a bird photographer like myself. For example, Red-headed Woodpeckers are very common around here. I see them about 50% of the days when I take gravel roads to work in the summer. And yet despite many attempts to photograph them over the years, I have precious few photos. They have a tendency to cling to a telephone pole or tree, and hop to the backside of it, placing the tree between the camera and themselves! With maybe a dozen half-way decent sightings of an Ivory-billed in the 2004-2006 time frame, I’m not surprised no definitive photo was obtained. But since then, there have been very few (credible) reports of the bird, and nothing as definitive as the sightings from dedicated ornithologists from Cornell and Auburn. Even worse, since then, many others have rebelled against the Cornell and Auburn sightings, claiming they were faked, either by a good-faith mistake, or by some weird evil intention. The one aspect of birding (and humanity!) that I absolutely DESPISE…mean-spirited people who love nothing more than tearing down the accomplishments of others. Some well known birders published their opinions about the sightings, claiming wrong-doing by the researchers who saw the birds. That spiteful, small-minded, petty hate/jealousy has since infected the debate, with far too many people dismissing the original sightings as faked. There’s a history here, as sightings of the bird going back decades have been decried as fakes, even when photographs were obtained. The best example…Fielding Lewis took very clear photos of a female Ivory-billed in 1971. George Lowery, head of the American Ornithological Union, excitedly presented those photos to the group’s yearly meeting…and he was greeted by catcalls and jeering. Even the most respected ornithologists in the world aren’t immune for the mean-spirited, EVIL treatment from the jealous birding crowd who will never accept a sighting regardless of the evidence. In the years since the Auburn and Cornell sightings, I’ve tried to follow the story, looking for evidence of additional sightings. One website I look at is “Ivory-Bills Live???!”. During the early years after the Cornell sightings, the site and others had many enthusiastic updates, and it seemed like better confirmed evidence of the survival of the species was just around the corner. As the years have gone by, that enthusiasm has waned and the reports have become few and far between, but I still check sites like this quite often. 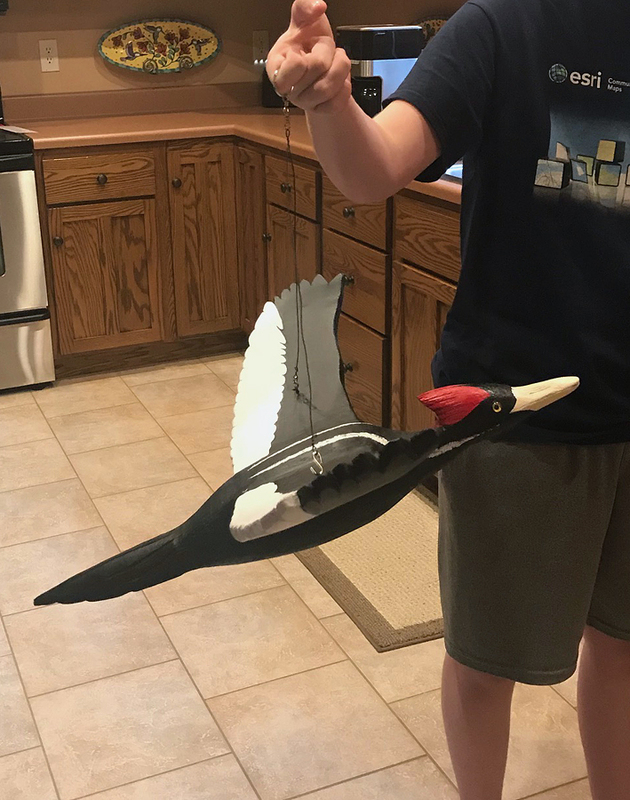 Over the summer I checked Ivory-Bills Live, and saw a post about some beautiful Ivory-billed Woodpecker carvings that were being done by a Dean Hurliman in Burlington, Iowa. The post stated that he was going to finish perhaps 8 more, bringing his total to about 50 of his carvings that were in the hands of birders and other collectors. The post had some words from Dean, saying he was looking for homes for his final set of carvings, and to send him a note if there was interest. Given the fascination I had with Ivory-billed Woodpeckers, I immediately thought of sending an email to Dean, but more for my son than for myself. My son is a teenager now and my part-time birding/fishing/rockhounding/outdoor buddy! He already had a bird painting hanging in his room, one he bought with his own money while we were on vacation. He also had some small carved birds he bought. I thought, what better way to continue that “spark” for a budding young birder, than having this unique piece? I crafted an email to Dean, noting where the carving would end up, and hoping that it would continue that birding spark in my son. I was hoping it would become one of his most prized possessions. To my surprise, Dean responded, and said he would start work on a carving to send our way! The carving arrived today…what a beautiful creation! What a magnificent creature! What a great rendition! I absolutely adore the pose, and Dean has it perfectly balanced for hanging. When hung, it’s in the perfect position, as a bird gaining altitude after taking off in flight. The carving now occupies a place of HONOR in my son’s bedroom, hanging from the ceiling in the “bird corner”, along with the painting he bought. Dean Hurliman…THANK YOU SO MUCH for your beautiful work! You have a heart of gold for doing this, and have you yourself become part of the lore of the Ivory-billed Woodpecker! The final display location for the carving, in the “bird corner” of my son’s bedroom. I can think of no better item to get a budding birder excited about the hobby.